1770-KF2: Converter between AB DF1 and Data Highway Plus DH+. 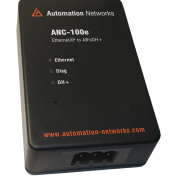 A 1770-KF2 is a converter that connects smart RS-232-C or RS-422-A (asynchronous) devices to AB’s DH+. You can communicate directlly with DH+ or Peer Communications by using 1770-KF2 switches and cables. Communication with a PLC5 node is achieved through PCL communications. Other AB products options for communication over a PCL include the 1784-T50 Industrial Terminal System and the 1785-KA Communication Adapter Module. The KF2 was created to work as a desktop options in the control-room. AC power is available from a wall outlet and it comes with the option of full-duplex or half-duplex protocol on its asynchronous link. The 1770-KF2 comes with either a point-to-point link or a multi-drop link connecting DH+ with a smart asynchronous device. The device works with RS-232-C or RS-422-A electrical standards. Describing the physical communication links to the KF2 and the various software scenerios necessary to allow a way for those links to operate. It interfaces a PC or PLC to an Allen-Bradley local area network (LAN), by using either a Data Highway or Peer Communication Link (PCL). By doing this the 1770-KF2 behaves as a gateway between two physical communication connections: Data Highway or PCL, named “Network Link” RS-232-C or RS-422-A, named“Asynchronous Link” A DH+ gives peer-to-peer communication between the converter and other nodes on the Data Highway. It is available with half-duplex (polled) protocol and the rotation of link mastership.